Drive shafts are balanced, one-piece, tubular shafts with universal joints at each end. Number used in vehicle varies: one shaft, 2 shafts with a center bearing, or 3 shafts. Three shafts are used in many 4WD applications. Location of slip joints varies with model and manufacturer. See Fig. 1. Fig. 1: View of 5 Commonly Used Drive Shaft Combinations Many 4WD models use 3 drive shafts. Tires and wheels - Check tire inflation and wheel balance. tread patterns or incorrect tire size. Engine & Transmission Mountings - Tighten mounting bolts. If mountings are deteriorated, replace them. shafts. If present, clean shafts thoroughly. joints. Check for loose bolts and worn bearings. Check that flanges on either end of drive shaft are in same plane. Often there are arrows on slip joint and drive shaft to aid in alignment. See Fig. 2. If flanges are not in same plane, disassemble universal joint and align. Fig. 2: Slip Joint Alignment Arrows Align arrows for proper shaft phasing. 1) All General Motors models with 32 splines use keys on spline and slip joint, which can only mate in correct position. On most models with 2-piece shafts, proper phasing is accomplished by keys on spline and slip joint. with "U" joint trunnion of slip joint in vertical plane. 4) Set differential pinion yoke trunnion in vertical plane. will be parallel. See Fig. 3. Fig. 3: Phase Alignment Of 2-Piece Drive Shafts Trunnion yoke ears on each shaft must be parallel. shaft and rotating it 180 degrees in relation to other components. Test by raising rear wheels off ground, and turning shaft with engine. prolonged periods, as overheating of engine or transmission may occur. shaft in 4 positions, 90 degrees apart. Place marks approximately 6"
forward of weld, at rear end of shaft. Number marks one through 4.
change, move clamp head to No. 2 position, and repeat test. vibrations may not be drive shaft imbalance. above and below best position, and repeat test. clamp(s) in position and repeat procedure at front end of drive shaft. this test procedure, send drive shaft out to be balanced. Align drive shaft and slip joint trunnions in same plane. 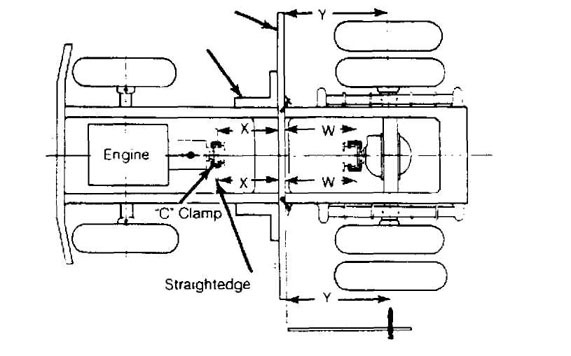 1) All flanges must be perpendicular in both vertical and horizontal planes to engine crankshaft. Only exception is "broken back" type driveline, which has flanges that are not perpendicular in vertical plane. See Fig. 5. Fig. 5: Typical "Broken Back" Type Drive Shaft Alignment Angle "A" equals angle "B". 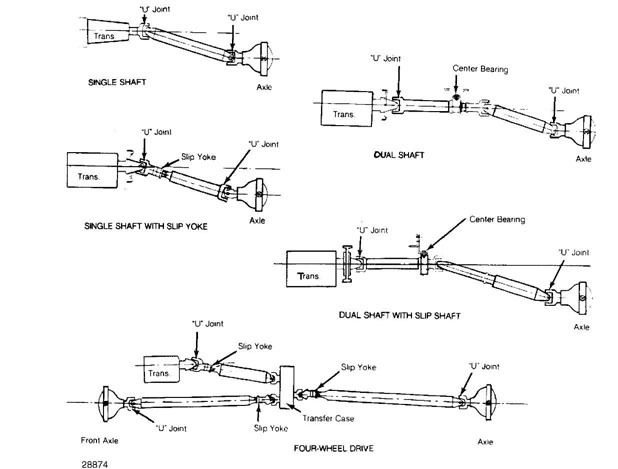 working angles of universal joints of given drive shaft are equal. Angle "A" = angle "B" . equal angle of drive shaft subtracted from pinion shaft angle. life maximized when universal joints are parallel. Fig. 6: Aligning One-Piece Drive Shaft Yokes must be parallel. flange, center bearing flange and pinion flange. If runout exceeds . 003-.005" (.08-.13 mm), replace flange. bore. If not, replace flange. Fig. 7: Vertical Alignment of Drive Shaft Flanges in pairs should be parallel. 8) Rotate transmission flange until it is vertical, measured from side. Measure angle from end and record it. Check all other flanges for same angle. They must be within 1/2 degree of each other. Adjust as required. 9) If difficulty is encountered when making these adjustments, horizontal alignment should be checked. Even though vertical alignment is correct, horizontal alignment can be badly out of adjustment. This is often found after major component replacement or repair of serious accident damage. See Fig. 8. Fig. 8: Horizontal Alignment of Drive Shaft Plane of trunnions should be parallel. 10) To make horizontal alignment checks, set straightedges up. See Fig. 9. Set transmission output flange horizontal and clamp straightedge to flange in a horizontal plane. Repeat procedure with drive pinion flange. Ensure that flanges are horizontal by checking angle of straightedge with spirit level. Measure at 6 points shown using straightedges and framing squares. framing squares to align straightedge with side rails. of each other, axle housing is misaligned.